truly how i felt today . . . finally circus day. zp, being the phenomenal person he is and knowing that it takes very little to make me truly happy, has been introducing me to all the things i did not do as a kid. 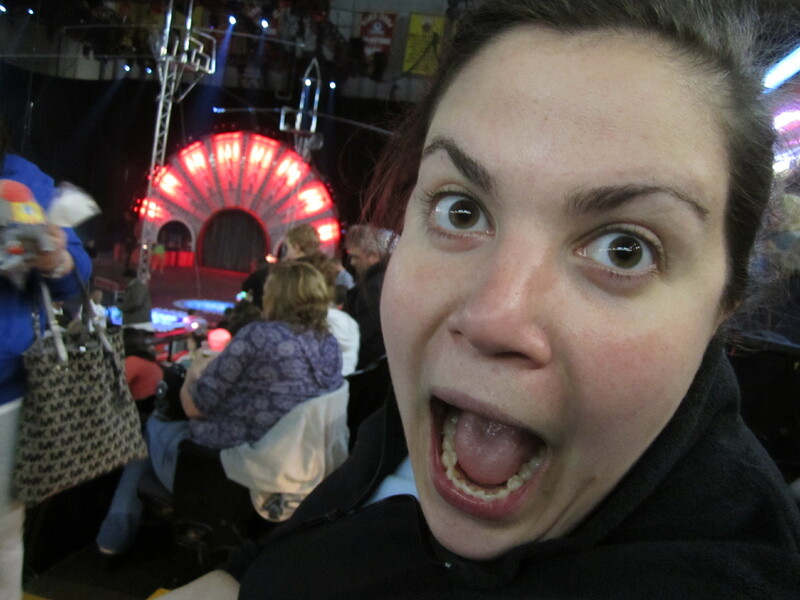 upon learning that i had never been to the circus, he bought the tickets and prepared me for the best day ever. fifth row end seats so i did not have to touch anyone and was close enough to be amazed and far enough to not be overwhelmed. 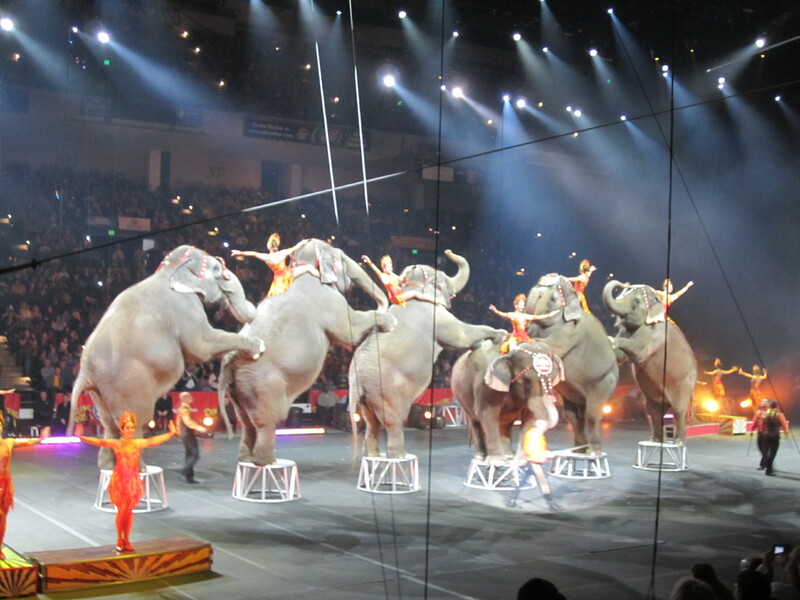 the circus was amazing and far exceeded every thought i had of it. it was the greatest show on earth and just as magical as i had hoped. elephants – adorable. well behaved. and they did such a good job at holding trunks to tails. 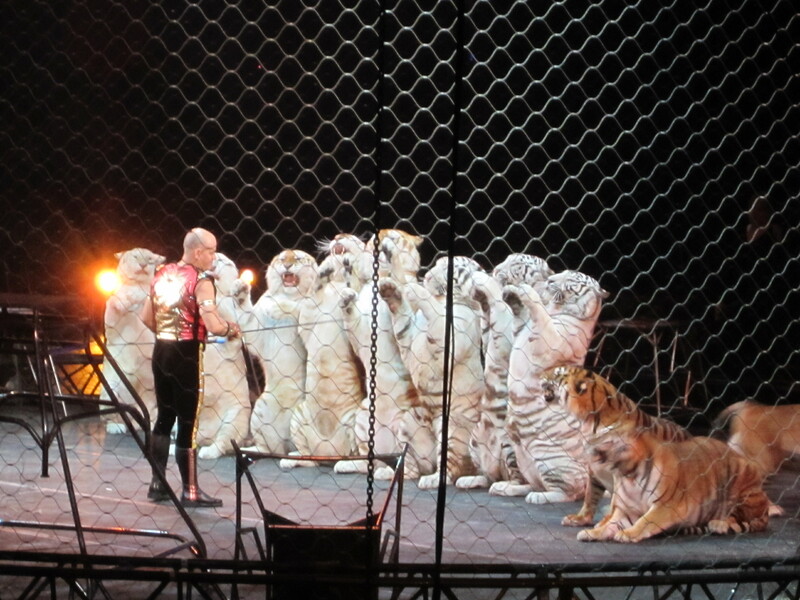 tigers – not my favorite, by far, but they were synchronized. stilt walkers – they glow in the dark. really, does it get any better than that?!? acrobats and tight-rope walkers – their coordination, speed, and focus on what they are doing with every light-up toy and sound going on in the background is amazing. and they are really good at what they do. cross-bow man – they set him on fire and shot him across the arena in the dark. and there were fireworks. and then they made him not on fire with fire extinguishers (not as fancy or cool as you think it would be). and then they gave him a new cape and he ran into the center like it was no big thing to have just been on fire. kind of wackadoodle, thought provoking, and REALLY stunning all at the same time. jugglers – they were juggle-tastic. aerialists – one of those things that always make me sit with my mouth hanging open. they as so strong and delicate all at the same time. the strong men – whether or not the log they carry is “that heavy,” you cannot fake them lifting eachother or four other people and twirling them around in a circle for what seems like a really long time. horses (and mini horses) – they pooped in the three-ring circus. and, the circus workers were really adept at cleaning it up very quickly. also, just for the record, they are mini horses, not baby horses. when asked her favorite part, bee listed everything. at the end of the day, she keeps going back to the elephants and how well they stay together, holding trunks and tails. lots of kids at the circus today and they didn’t even bother bee. well, other then the one that kicked her in the back, LOL. as a child, she never went to the circus so we have been fulfilling all those childhood activities one at a time and the greatest show on earth was in town so we went and saw the clowns. 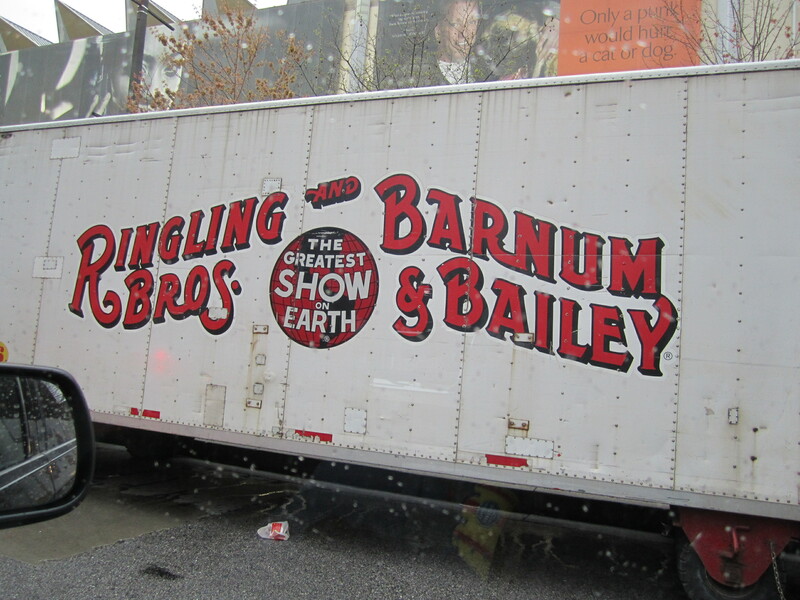 this circus show was themed “fully charged.” lots of lights and excitement as well as the standards. sadly, the clowns didn’t pile out of a car like you would see on any circus show/movie. 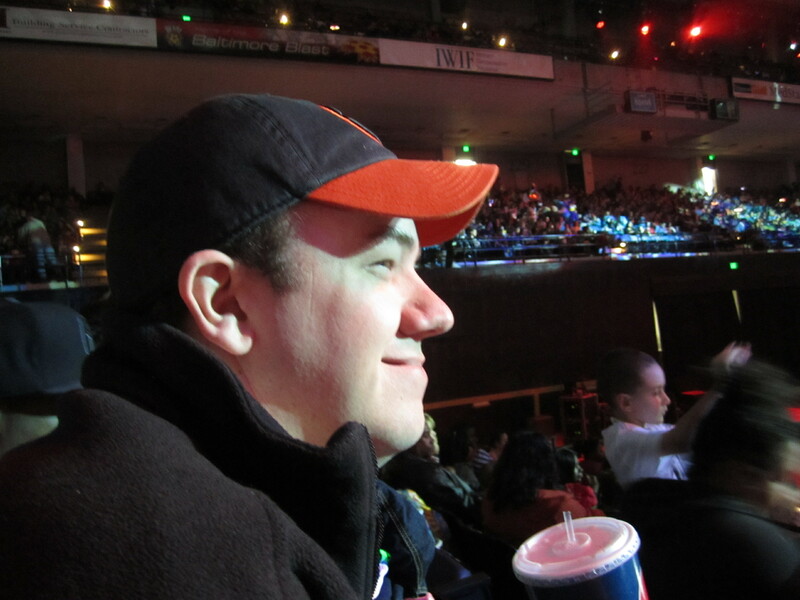 of course, the guy flying across the arena on fire made up for it. funny how the simple things in life make her smile for days at a time. or a $12 snowcone in an elephant shaped mug, haha.